It's been a long while since I've read paranormal romance, so this book was a nice change of pace for me. I love a good bite scene and Eye of the Beholder had a few of them that were well done. I enjoyed the steamy scenes between Vulcan and Cassius enough to sift through some long discussions on the Roman empire (from an aged vamp's perspective) and talk of old names and such. The two main characters were sweet and endearing and I enjoyed their banter and spark. Being hunted by an old rival, the coven is up in arms and Vulcan isn't letting Cassius fight the battle alone. He's just found someone he's willing to live (and die for) and despite everything his mentor taught him about fearing vampires, Vulcan can’t help but love Cassius. There're some different spins on the vampire nature in this book, so it's not all the same old vampire stuff, but there are some that I have found repeated in other well-known stories also. Decent mix of what you'd expect with a new a new perspective added in. Loved the epilogue – happily ever after! 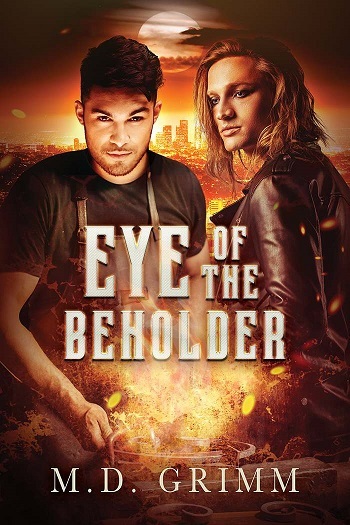 Reviewers on the Wicked Reads Review Team were provided a free copy of Eye of the Beholder by M.D. Grimm to read and review.